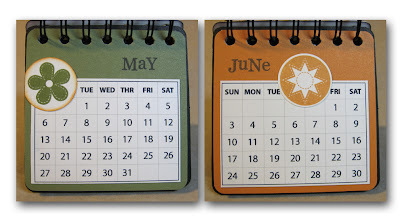 June is a month of Jubilation! 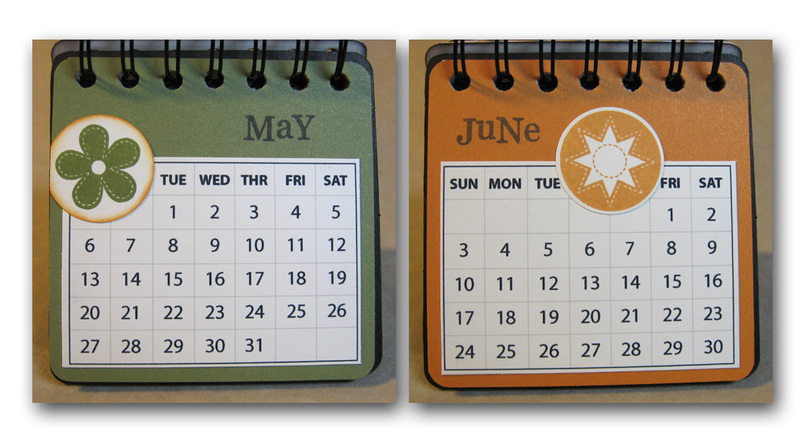 The Stamp of the Month for June is called "Jubilation" and it's one you won't want to miss, especially if you have a 1 1/4 inch circle punch. This year-round holiday style stamp set from Close To My Heart is so versatile! Just check out all the images that come in this set. (see image in the righthand column of my blog). 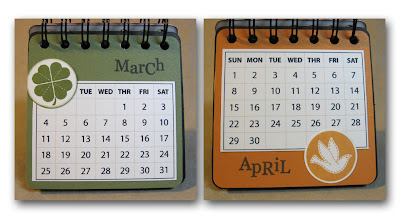 Not only do you get 12 unique images to suit each month of the year, there are also smaller image circles (3/4 inch) and phrases like Super Mom, Just for You, Celebrate and more. 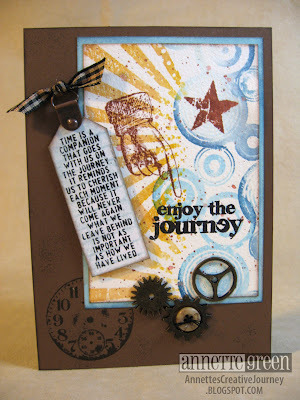 This month's Blog Hop showcases about 50 other consultants' creations with this stamp set, so if you need inspiration you've come to the right place. Just hop along and check them all out. If you are already hopping you came here from Angel Sawyer's blog. Keep scrolling through my post to see where to hop to next. Now on to what I came up with. I couldn't settle on just one or two of the images in this set for my design, so I used all 12 large circle images along with my CTMH 1 1/4-inch circle punch to create a little desktop calendar. 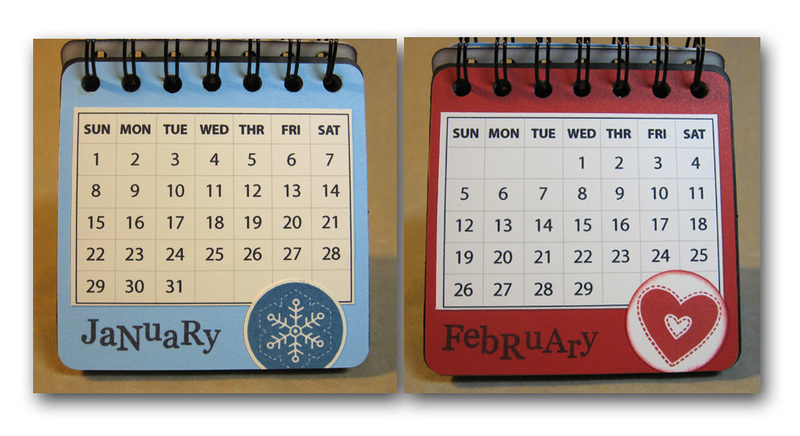 With a little help from the Pennant Alphabet stamp set, I added the year to the front of this coaster-size calendar. I stuck with colors like Cranberry, Indian Corn Blue, Goldrush and Topiary. 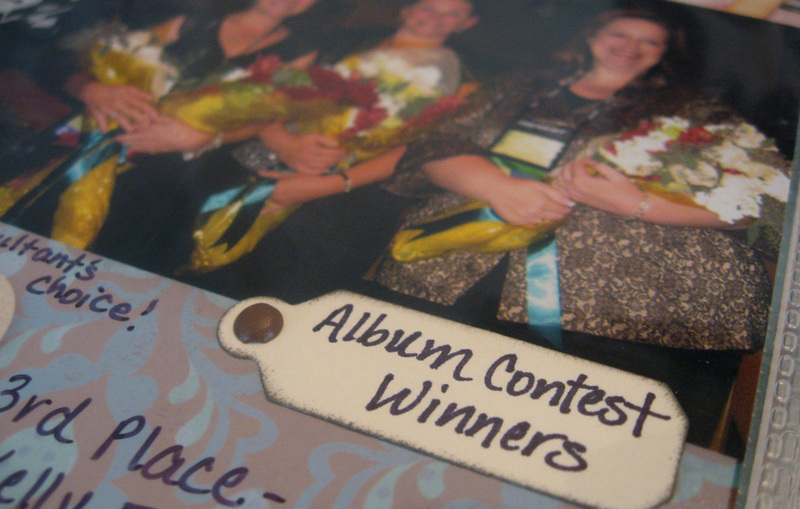 I stamped all the colorful images directly onto the Colonial White card stock cover. 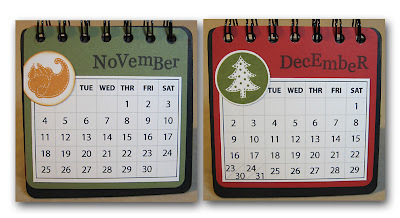 The actual calendar portion of the pages started from the internet. I'm sorry I don't remember exactly where I got them, but there are a zillion sites out there where you can download free monthly calendars. Just Google it. But honestly I couldn't find any that suited the size and style I wanted, so I printed out the free download to use as a reference for 2012 and created my own in Adobe Illustrator. It didn't take much time at all. Here are the pages inside. Very simple and clean. The month stamps are from "Throughout the Year" which is now retired unfortunately. I think I know what I'll be making LOTS of at Christmas time. 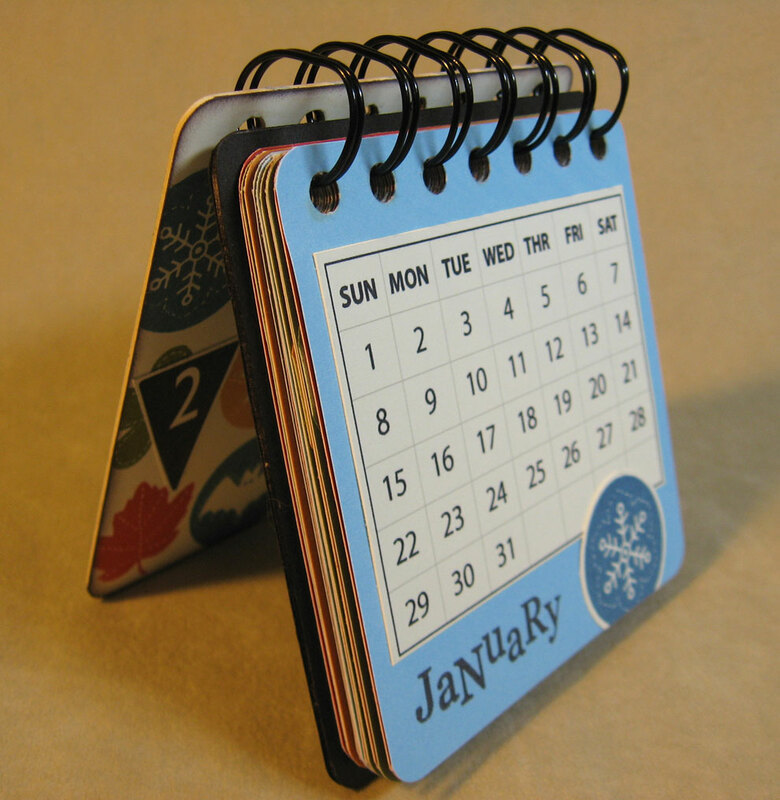 These are so simple and compact and functional. I like all of that! So thanks for stopping by. 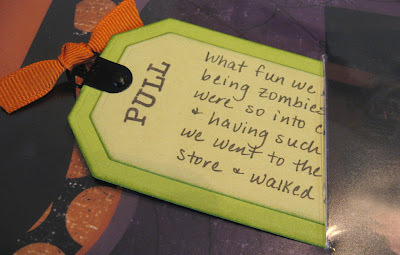 Now keep on hopping through the Blog Hop for lots more ideas by going to Lori Brown's blog. 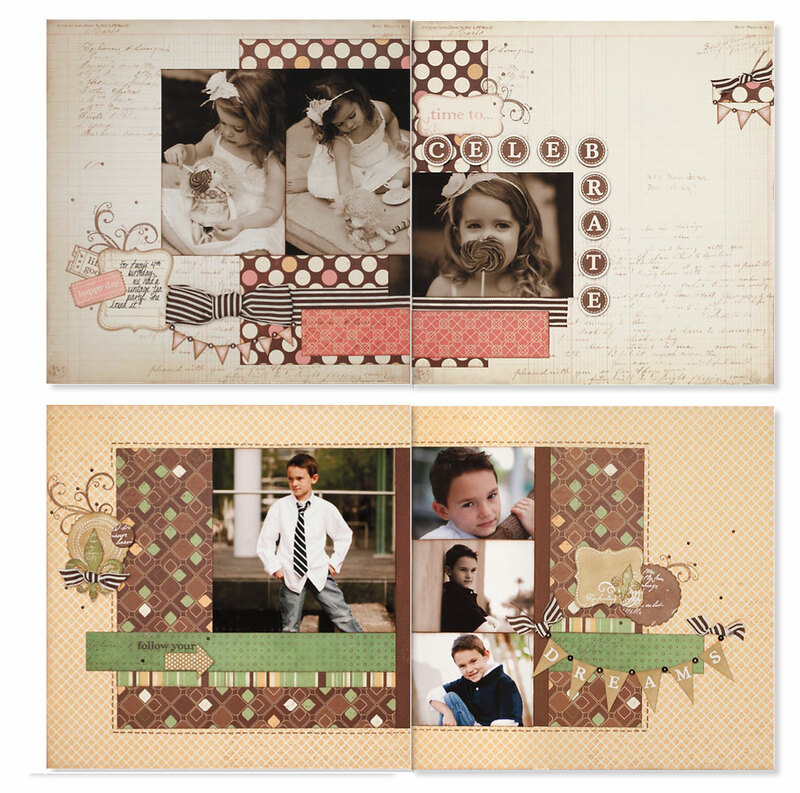 On Monday I posted the beginnings of a mini album I'm designing utilizing Close To My Heart's You & Me scrapbooking kit to show some alternative ideas of what you can do with this fabulous kit besides the four scrapbook pages. 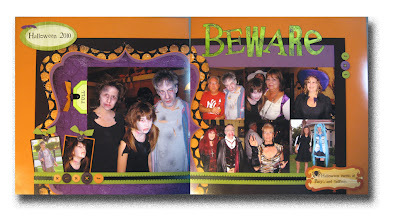 As promised I am sharing the inside pages with you today. 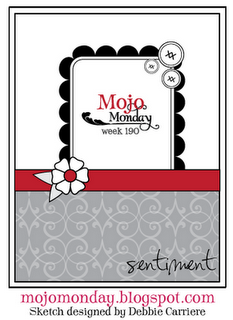 Be sure to check this past Monday's post for all the details on how you can get this beautiful kit. But hurry because it only last through the end of May! Close-up detail of the Irresistibles chipboard shapes in this kit. Pages 2 & 3 include an additional pocket page made from Kraft card stock. 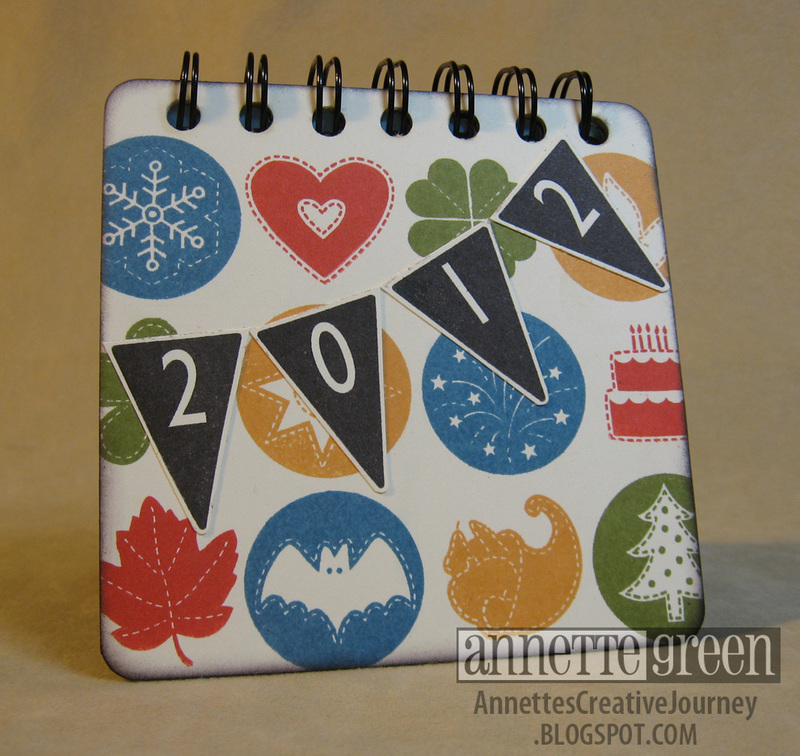 Using the wide Chocolate ribbon in the kit, I made a pull-out tag for additional journaling. This serves as an interesting journaling flap so you have more room for photos on the actual page. 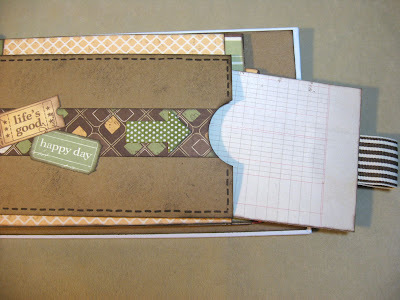 There's another Irresistible chipboard piece on the page. Pages 6 & 7 include this handmade envelope that opens from the side. 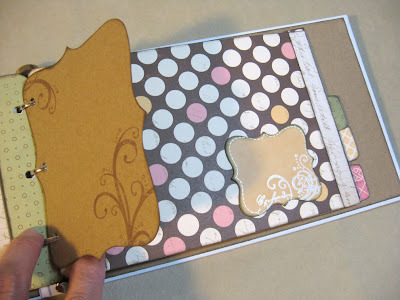 I used a Spellbinders lacy circle for the flap. 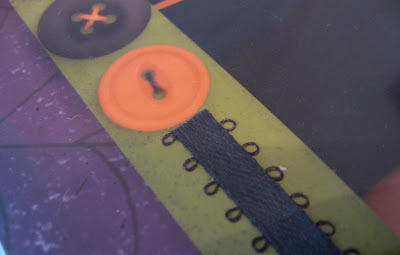 The two circles that hold the waxy flax are again resist chipboard covered with Smoothie ink. 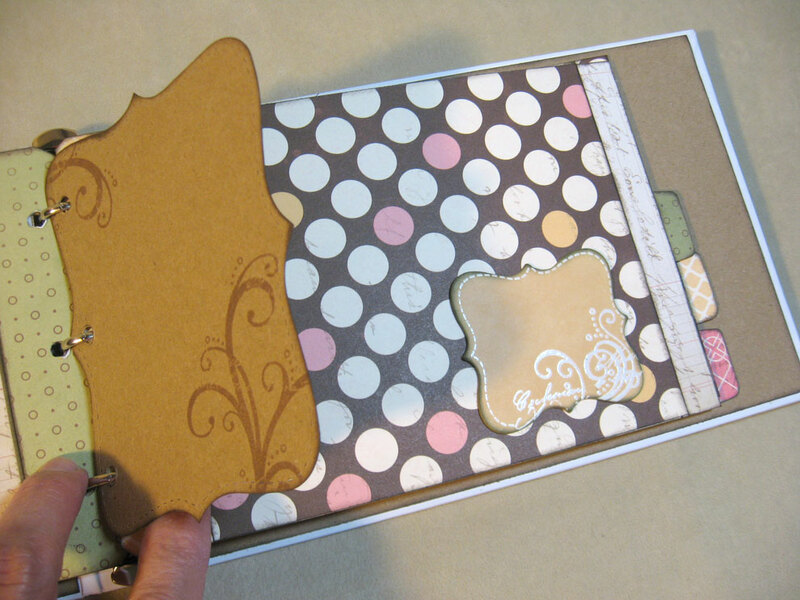 A pull-out tag inside can be easily pulled out by the resist chipboard piece that I inked in Cocoa. 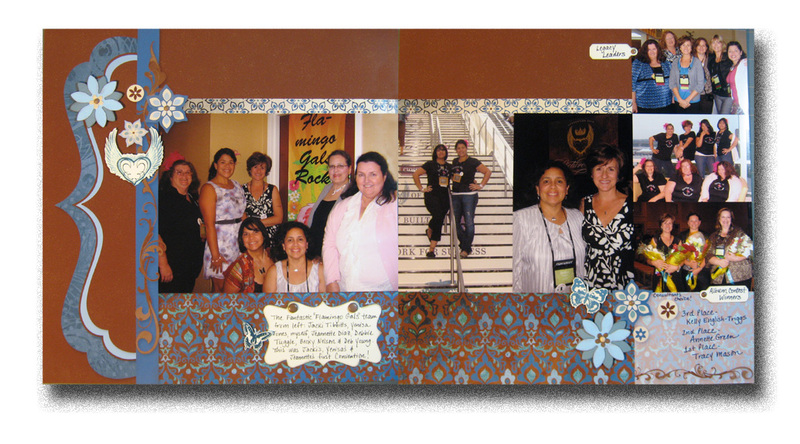 Pages 8 & 9 include this file folder flap that I stamped with some rules and the fleur-de-lis from the You & Me stamp set included in the kit. So that I could sandwich that piece of ribbon between the layers, I added another die-cut file folder from pattern paper to the back of the Kraft file folder. Page 10 is the last page and I didn't do anything with the inside back cover... yet. I want to make some cards with the leftover supplies from the kit first, and if I have anything left maybe I'll go back and dress this up further. Killing a few birds with one stone today, so to speak. Trying to be efficient with my time. My card design meets the challenges of both the Play Date Cafe and Grungy Monday 08 at L3Studio. 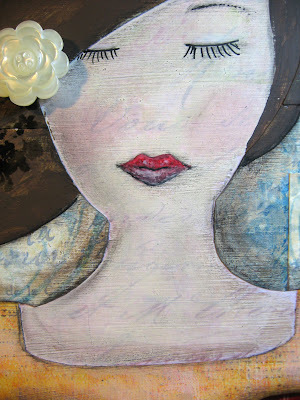 This week's Grungy Monday Challenge features a watercolor technique by Tim Holtz entitled "September Technique Challenge" from 2008. Be sure to view his tutorial and beautiful samples using this technique. 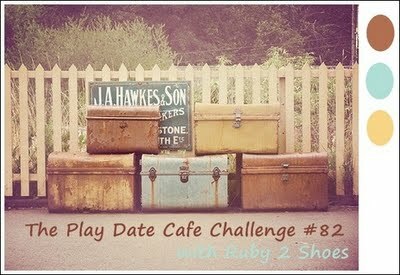 But first, the Play Date Cafe Challenge #82 utilizes the colors shown here. Love this photo of the vintage trunks! The technique is simple and quite fun to experiment with. 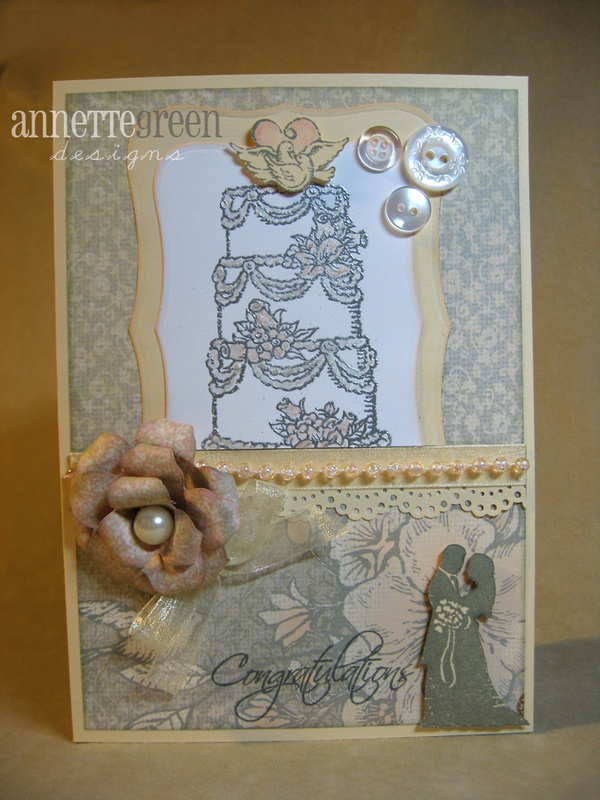 Tim used stamped images of flowers and such which worked beautifully with this technique. 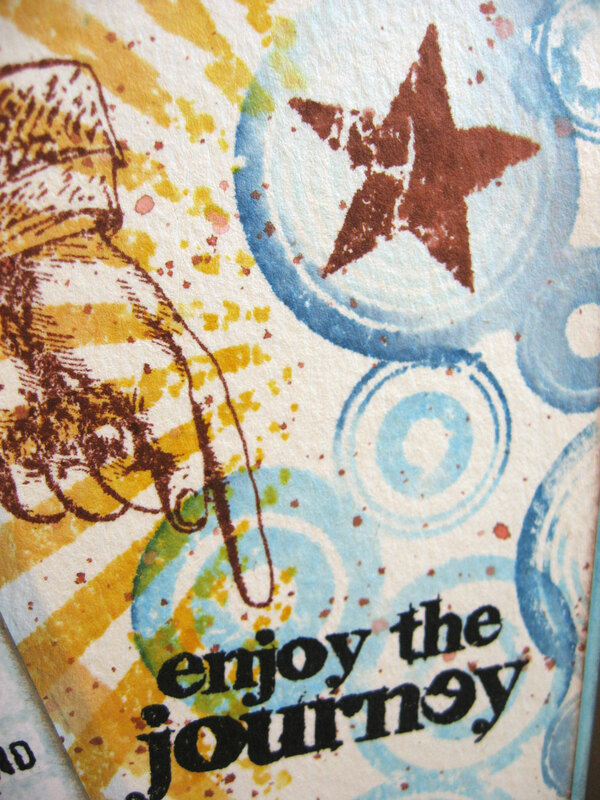 For something different, I went with his new stamp set called "Grunge Cirque" plus "Playful Journey." Tim does all the explaining for you, but basically you select a stamp, you ink it up in a few different colors, spritz it with water and stamp onto watercolor paper. I did this with the circle pattern and the rays, and also the star, finishing it off with a splattering of the brownish red color all over. Love how that looks like watercolors. Great fun! Good Monday morning bloggers! 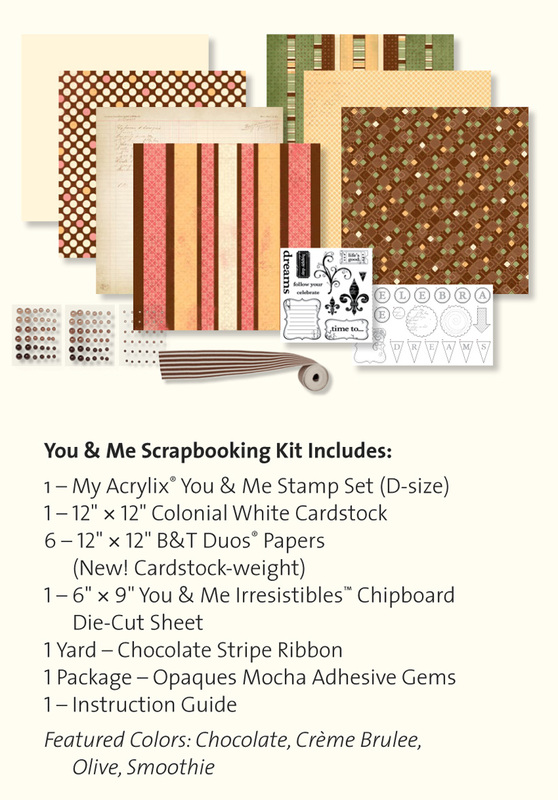 May is almost over and that means the beautiful "You & Me" kit offered through Close To My Heart will soon be unavailable. 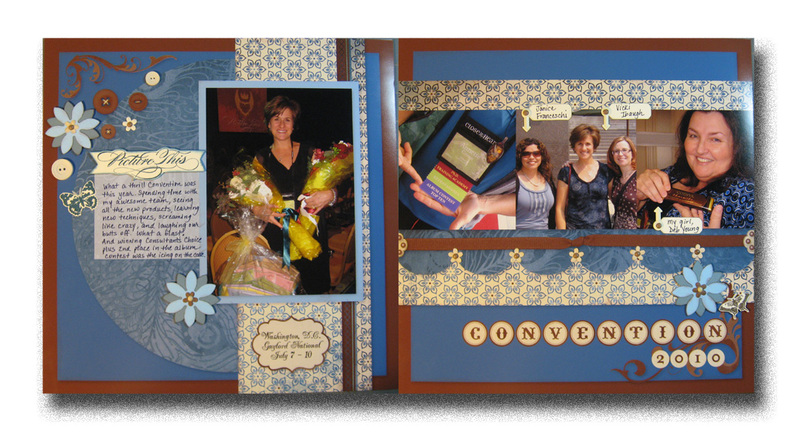 This kit is intended to be used as a scrapbook layout kit with everything included to make the four pages you see here. 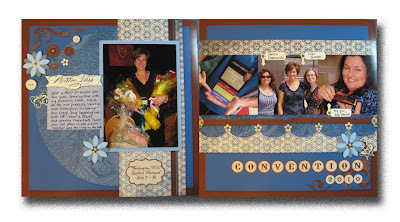 Keep reading to see what is included in this fabulous kit. 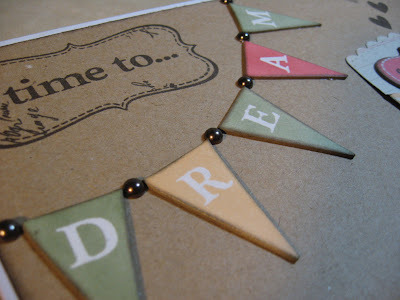 I love this kit so much, I got a second one to make some other fun projects beyond scrapbook pages. I'll be sharing those projects with you this week. My first project is this mini album. 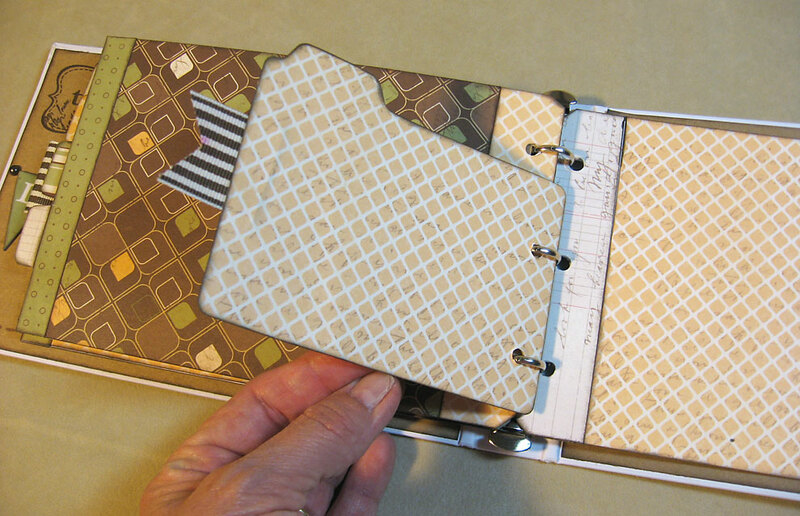 This begins with a My Creations 3-Ring Binder which measures 5 1/2 x 8 1/2 inches. Be sure to click on the photo to see the details better. 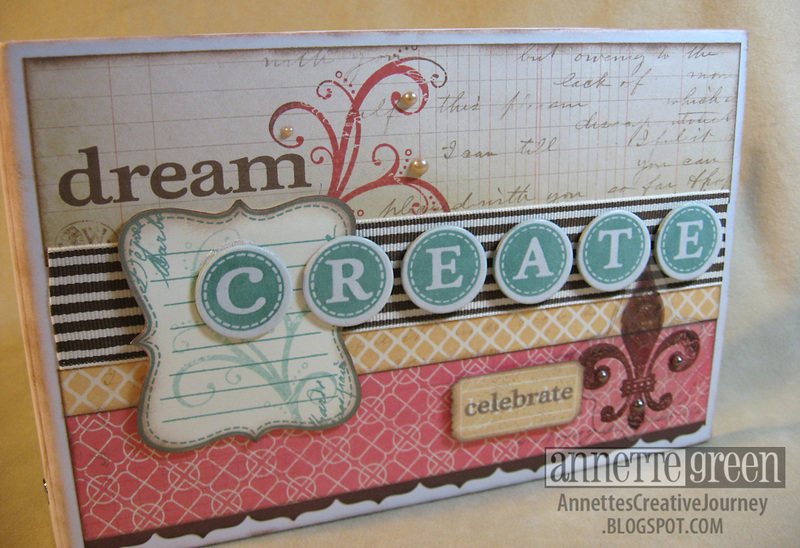 I used the resist chipboard letters in the kit to spell CREATE rather than CELEBRATE. I cut the "s" off of the word "dreams" (yes, I cut my stamps!) to make the word "dream" and stamped the word "celebrate" right over the top of the ticket stamp. 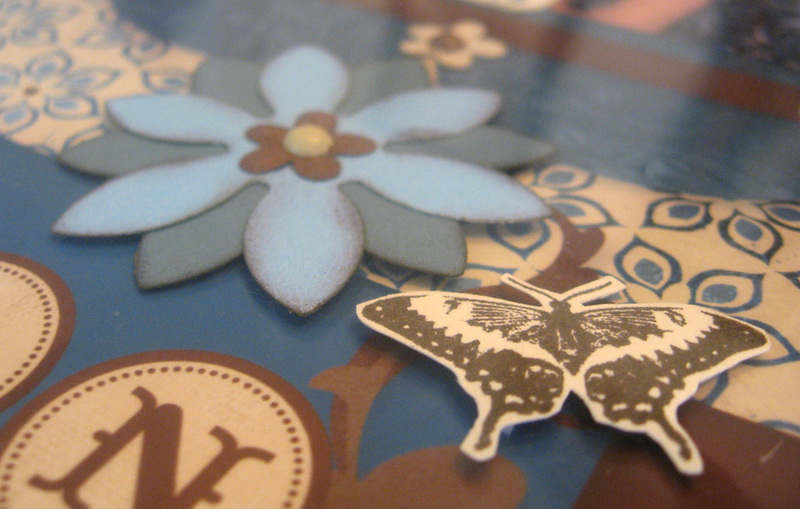 The fleur-de-lis stamp has been done on a piece of clear plastic using brown Staz-on ink then I cut closely around it and finished it off with some of the Mocha Opaques. 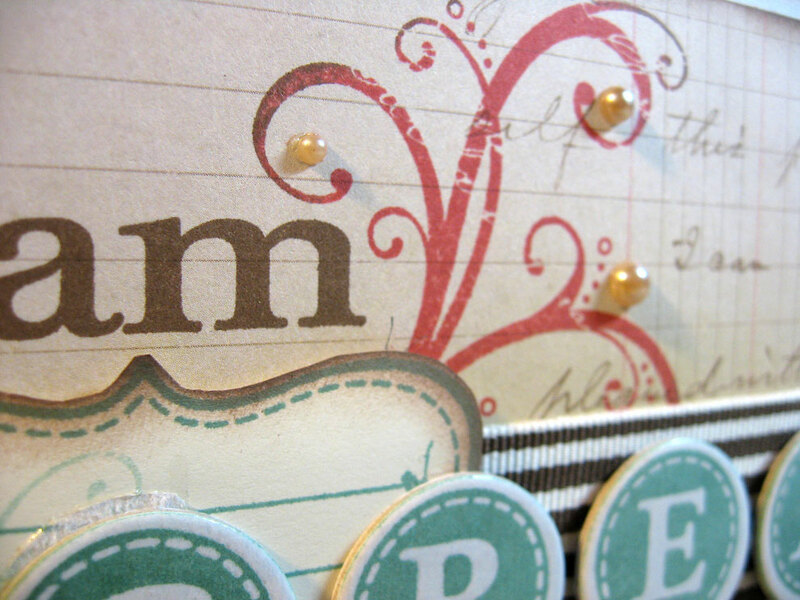 More of those pretty embellishments have been added to the stamped flourish next to the word "dream." I'm working on the inside pages today, so I'll share those with you later this week. This special promotion is available only through the end of May. If you are already shopping with me on my CTMH site and spend a minimum of $50, then you can get this kit for only $15. That's more than HALF off the retail value since the stamp set alone retails for $22.95! The website will automatically ask if you want to add it to your order if you've met the $50 minimum. Super easy! If you simply want the kit and nothing more, you can certainly order it at the full retail value of $34.95. Just use item number CC1012 when ordering. Another Studio J video in the series to show you how to manipulate your photos in your layouts. Lots of good tips here on making sure your photos are of best quality and resolution for print too. This week is all about Studio J. 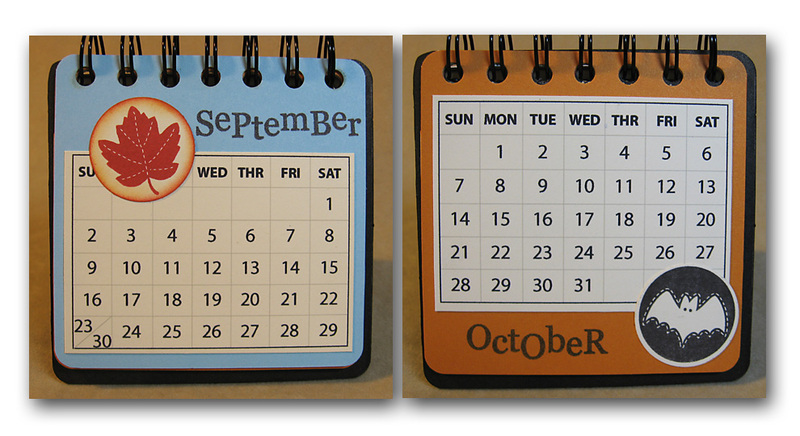 Here's a great video that demonstrates how easy it is to get started. 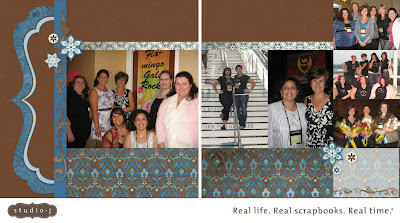 Many of us scrapbookers became scrapbookers in the first place because we love crafting. 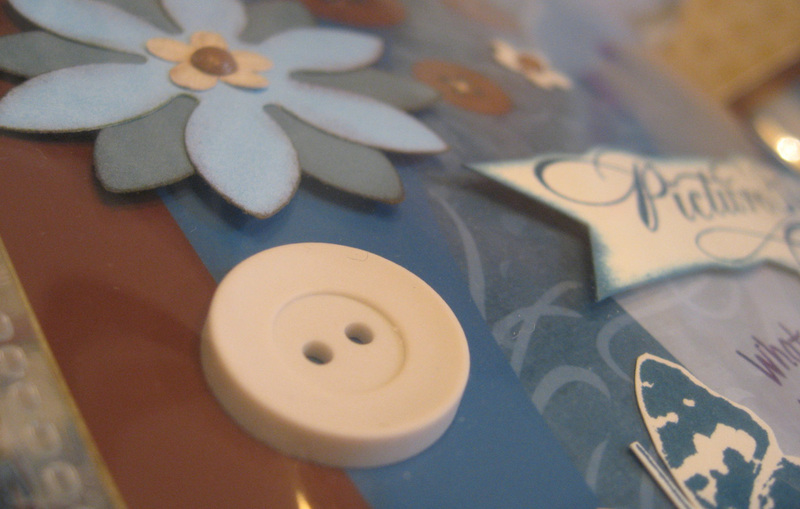 The adhesive, the flowers, ribbon, buttons, die cuts... It's all so much fun to play with and layer up! It's a tactile thing. It's all about creating something with your hands. So I totally get the resistance to digital scrapbooking. Although hybrid scrapbooking isn't a new concept, it is fairly new to me, and I have discovered that this might just be the answer to getting my pages done a little faster. Hybrid scrapbooking is combining digital and traditional scrapbooking. I could have easily done the journaling and the titles and everything digitally, but the point here is I didn't want to. 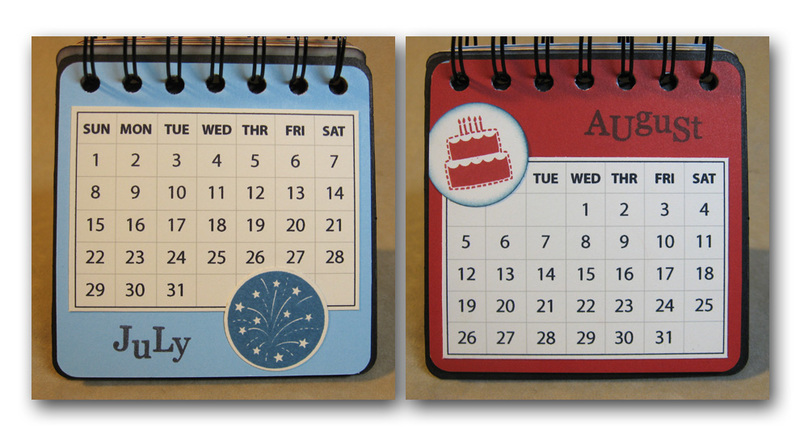 I purposely kept the digital layout fairly simple, got the prints and then added some dimension myself. 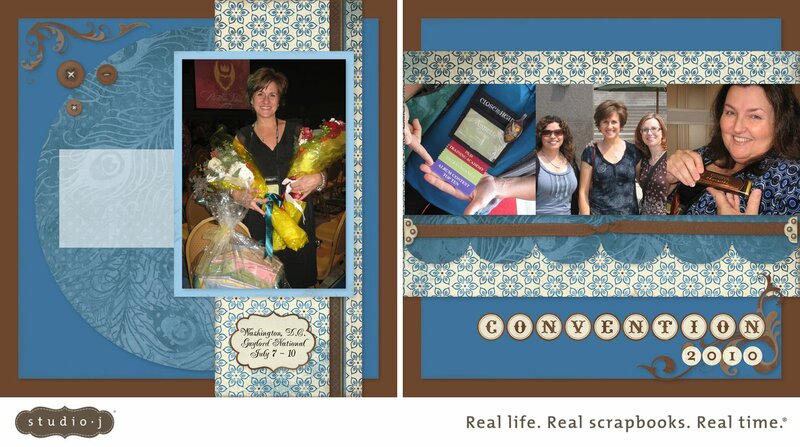 When people flip through my scrapbook, they can't tell what's digital and what's not. 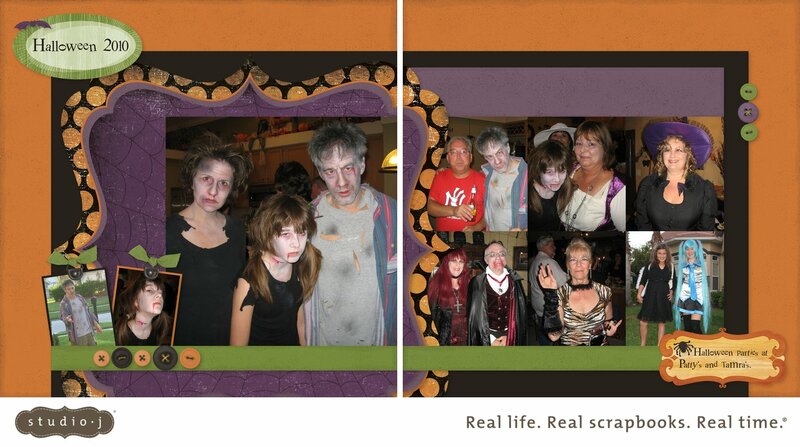 And the pages came together in a snap! Here are a few close-ups of the added embellishments. Photography isn't that great due to the page protector, but I think you'll get the idea. 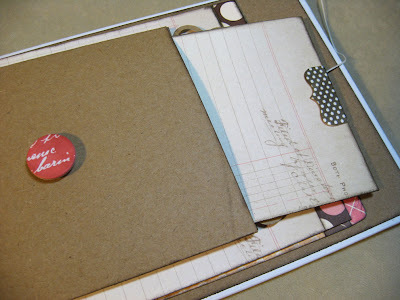 ...plus I really prefer to hand journal most of my layouts. It gives a far more personal touch. I even wrote right on the printed layout with a black Sharpie fine point pen. Worked nicely. More on Studio J in the days to come, so stay tuned. Meanwhile, thanks for stopping by today. Okay, really weird. 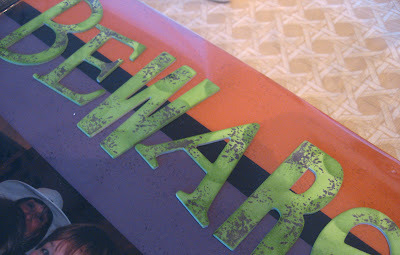 My Grungy Monday 06 post has simply vanished. I posted it a few days ago and it's not longer in existence. So I'm doing this quick post without much description today to get the artwork back up on my blog. I'm running out the door for some Friday errands. Hopefully I'll get back on later to describe this week's Grungy Monday 06 Challenge. What is this Grungy Monday anyway? Linda Ledbetter from Studio L3 hosts a weekly challenge featuring a different Tim Holtz technique and we papercrafters take that challenge, put our own spin on it and post our creations on our blogs and post a linky on hers. You can find Studio L3 here. Be sure to check out all the great creations posted there. This week's Grungy Monday 06 challenge features a technique of Tim's from his 12 Tags of Christmas 2007. You can view his tutorial for his technique here. 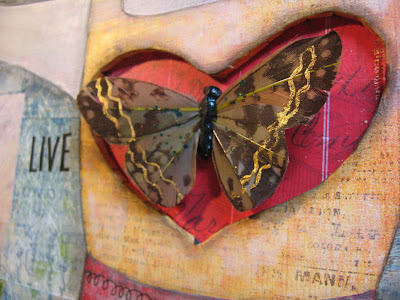 Basically he teaches us how to create a woodgrain effect with paint dabbers, inks and distress tools. My 5 x 7 card is here. I used Stamper's Anonymous "Artful Flight" (Tim Holtz Collection) stamp set. My woodgrain effect started with a Gold dabber, then Espresso, then I inked over the surface with Vintage Photo and after distressing the outer edges, I inked with Walnut Stain. 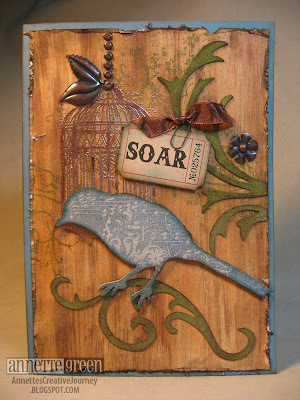 Other items used: Bronze embossing powder for the birdcage, Peeled Paint ink for the background foliage stamping and over the Elegant Flourishes which were cut from Grungepaper. The bird was stamped with CTMH's Twilight ink onto Grungeboard, then I cut around it closely and ink-distressed the edges. 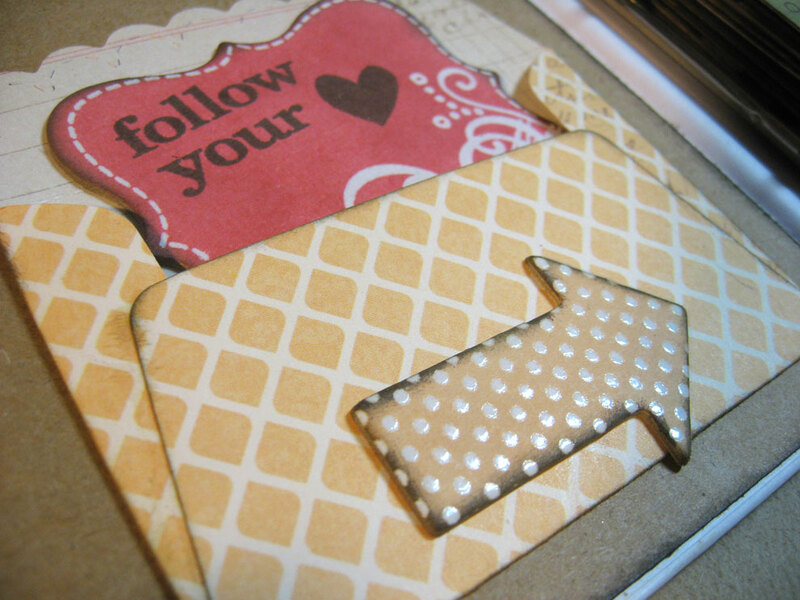 The Adage Ticket, tiny paper clip and Foliage Idea-ology pieces add the finishing touches to the card. Thanks for stopping by my blog today. Let me know what you think of this Tim-inspired card. It was great fun to make! My friend Linda needed a wedding card and flattered me by saying she'd rather have one made by me than a store-bought card. So after the swelling of my head went down, I got to it. I used CTMH's Bliss papers and the "Simple Memories" and "Precious Love" stamp sets. 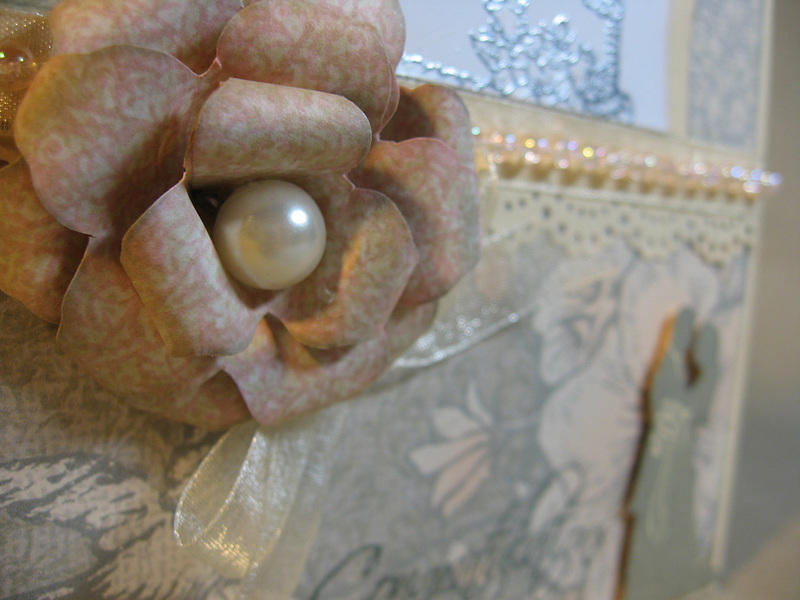 The flower was inspired by Tamra Pope's creation using a doily stamp from Simple Memories. I stamped several of them, snipping a little from each one to create the nested flower look. The cake is stamped and embossed with silver then painted in here and there with a touch of Pearl Paint mixed with Parchment re-inker. This gave the flowers and the frosting a little color and shimmer. The pearl inside the flower is from Tim Holtz Idea-ology. Although we've technically been a couple for more than 25 years, today marks 19 years of marriage to my husband and best friend Paul. It's been the happiest time of my life being married to a guy who makes me laugh practically every single day; someone who is so giving and selfless; so tough yet so loving. It's so comforting to have a partner who I both enjoy spending time with and feel content without when we are apart. This is what I define as a very happy marriage. Went to the Mazda dealer for an oil change (Starbucks in hand) then to Orlando for a Mother's Day shopping spree for me at one of my favorite scrapbook stores The Scrappy Boutique, lunch at Chipotle's, then back to Melbourne where we opted to skip the traditional dinner date and instead gave ourselves a generous budget each and went shopping! Dinner consisted of food court fare at the mall while talking and laughing. 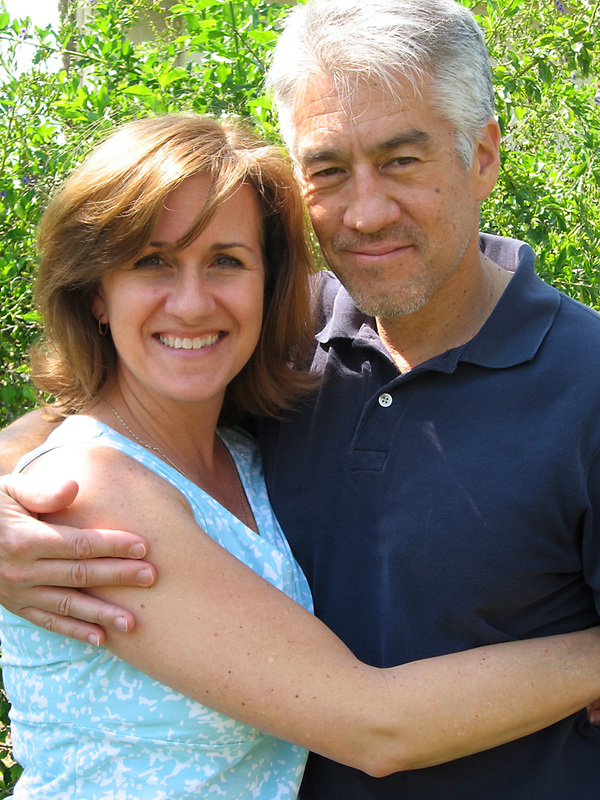 Happy Anniversary Paul. I love you. 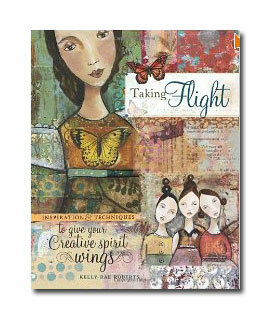 Recently I was roaming around my local Michael's store and found a lovely book called "Taking Flight, Inspiration & Techniques to Give Your Creative Spirit Wings" by Kelly Rae Roberts. It's not a new book. In fact when I mention it to my friends, many of them have heard of it and of Kelly Rae Roberts. Maybe I'm just a late bloomer, but this was a new discovery for me. Maybe it's like people asking me "Just who is this Tim Holtz you are always talking about?" Back to the book. If you've ever seen it, the cover alone calls to you. Just the name "Taking Flight" speaks volumes. Then there are the whimsical illustrations of simple faced women with a sense of peace and happiness about them. And as you turn the pages, you are enveloped in colorful collages, with layer upon layer of distressed goodness, not to mention (the main point of the book) encouragement, inspiration, understanding and a sense of camaraderie. I couldn't believe how she spoke to me. Directly to me. It was as if she knew exactly what's been going through my mind and where I currently am on my creative journey. Needless to say, I highly recommend this book if you are a creative person. 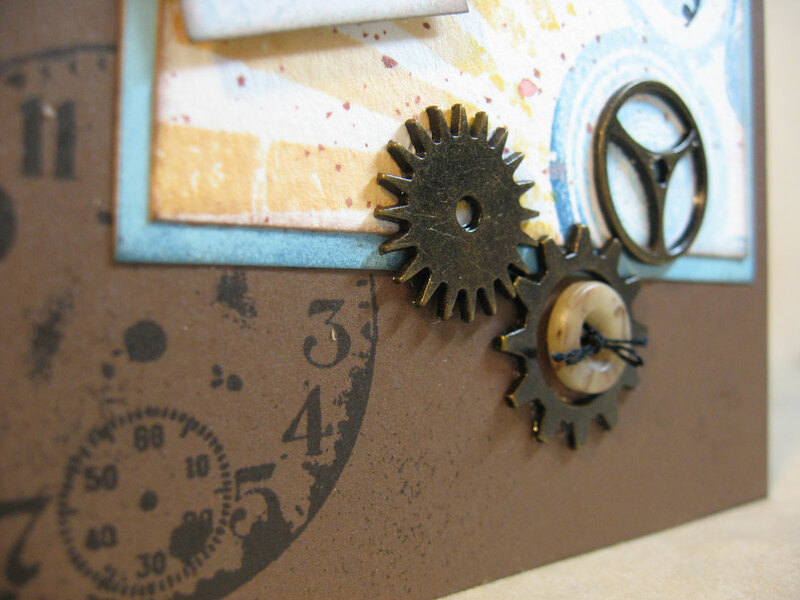 This week's Grungy Monday Challenge seemed like a good opportunity to mix both a unique technique by Tim Holtz with art inspiration from Kelly's book. 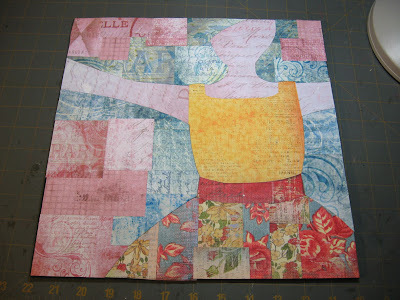 The challenge this week is to recess something into your artwork. Tim has a great tutorial on his blog right here. If you click on the image, you'll see the details better. 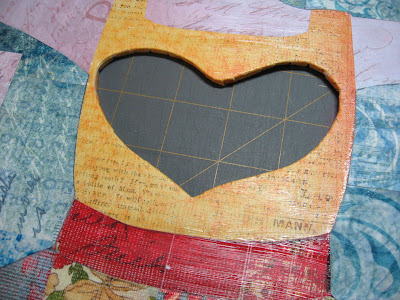 Namely the recessed area of the girl's heart. This was my first attempt at a mixed media art collage of this magnitude. I pretty much played with this all day, and loved every single second. It was something new for me and I was a little intimidated at first, but that is precisely Kelly's point in her book. Overcome those creative fears, try something new, explore, learn and grow! 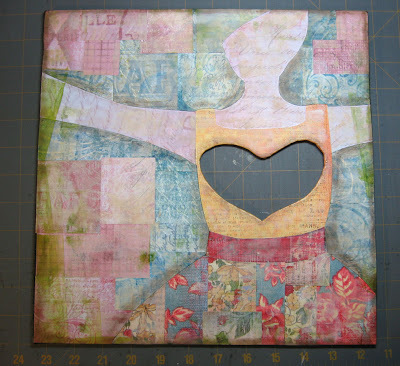 My piece is 12 x 12 and if you're interested, keep reading and I'll share with you my steps along the way as I created it. Much like Tim, I started with a 12 x 12 piece of black foamboard. 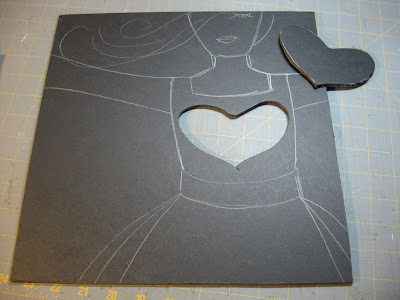 I sketched my girl with a white pencil and cut away the heart with a sharp Xacto blade where I wanted to create the recessed area. Kelly does hers a bit differently. I decided to do more of a patchwork-style art collage using many of her techniques in distressing and the details. I don't know if my method is a good one. I just know it worked pretty well for me. 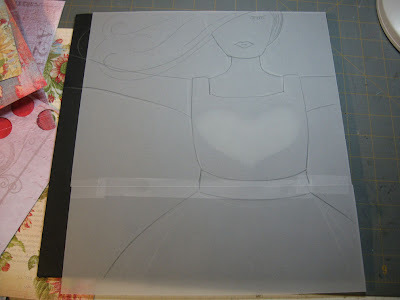 I made a tracing on an overlay of vellum that attached lightly to the top of my foamboard so that I could flip it down periodically to check the placement of my paper pieces. 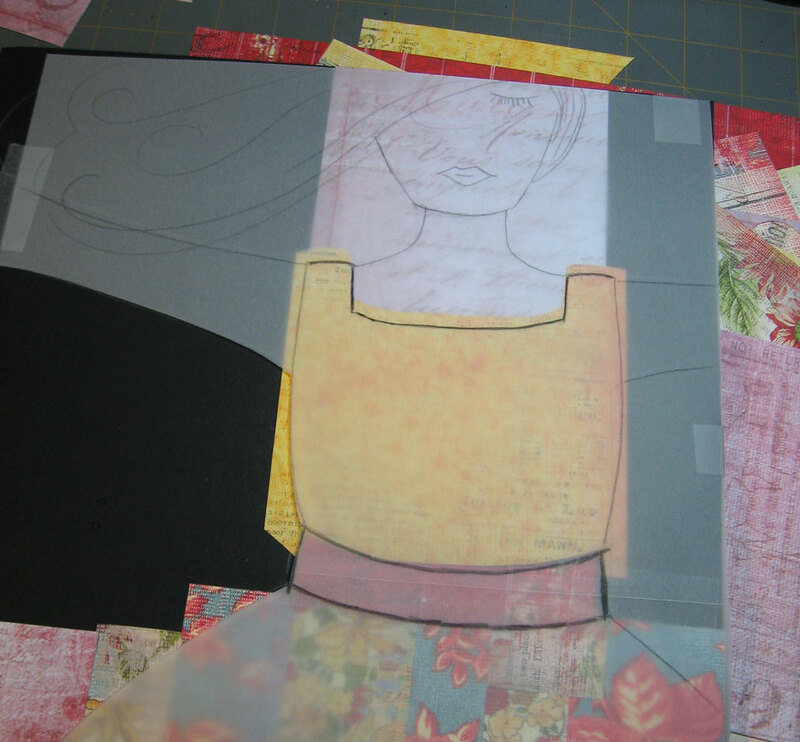 I cut closely around the tracing on the vellum as I went along to make it easier to place the paper pieces down. I knew I was going to be overlapping papers, so I had to work strategically in my placement. Once I got all the paper pieces down, this is how it looked. I was thrilled so far. I was actually doing this! Here's where Tim's technique comes into play. 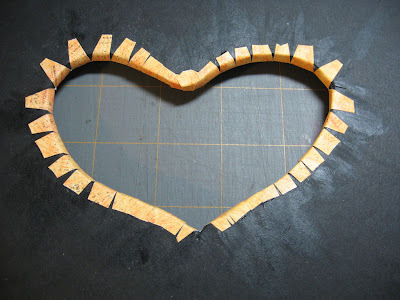 I flipped the board over and cut through the center of the heart, then made these snippings so I could fold them over and stick them down. If you sew, it's kind of like clipping curves. This is how it looks from the front now. Kelly suggests using a brayer and a few neutral colors of fluid acrylic paint to cover the artwork to give a more uniform look and texture. This really toned down the bright colors nicely. (I didn't really know what fluid acrylic paint was, so I added a little water to my regular acrylics.) 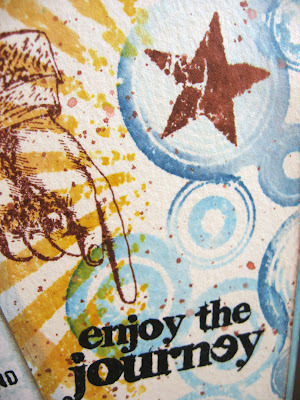 I added some alcohol ink (green) to the brayer for a little more color. Then a final distressing with Walnut Stain on my finger for the edges and over the artwork in certain places. For the hair, I painted on some Espresso dabber paint with a brush, thinning it a bit with water but not too much. And for the girl's skin, I used a fleshy color acrylic paint thinned with water quite a bit. I really wanted to be able to see the script writing under the layer of paint, especially in her face. See it? I love how that looks. I added charcoal pencil around most of the artwork, smudging it with my finger. I even used my Copic markers on the girl's lips, just to see if they would work with all the paint and layers. They did. I added a layer of paper behind the recessed heart then added this butterfly from the craft store in the floral department. It had lots of green in it which went well with the green alcohol ink accent I added earlier. 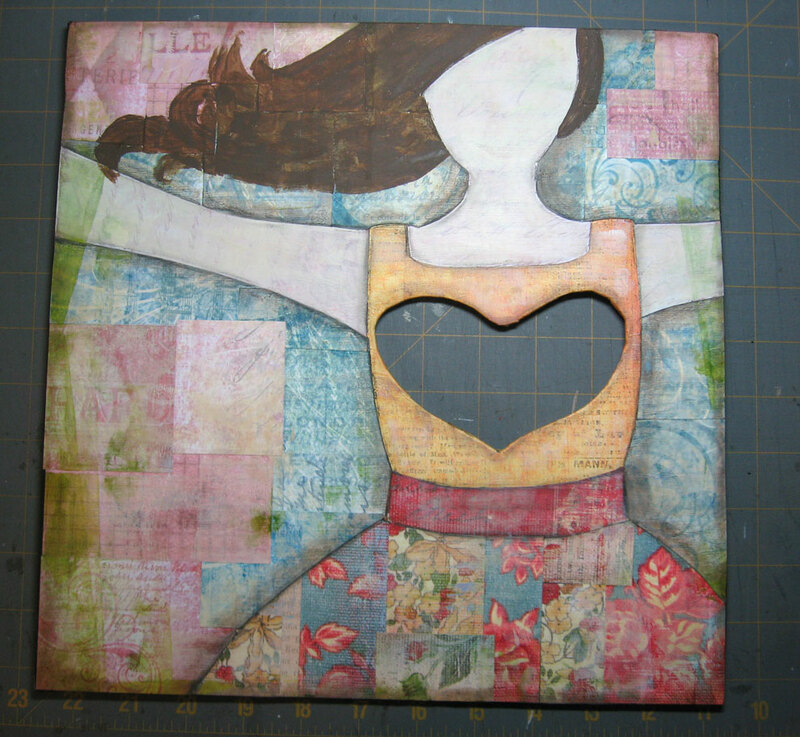 I finished off the piece with stamping in her hair and rub-ons here and there. The flower in her hair is a button from Tim Holtz, and in case you didn't notice, minus the girls' dress, most of the paper piecing is done with Tim Holtz Vintage Shabby paper stash. 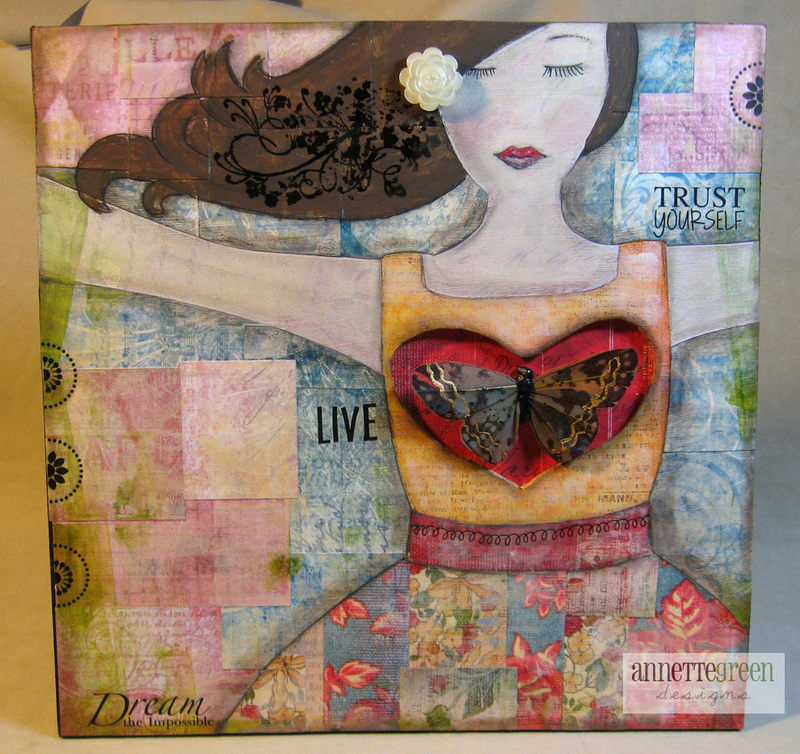 When I created this piece, I had the "Taking Flight" concept in mind. The girl is at peace, her heart is open to new possibilities and her arms are outstretched in her willingness to soar and grow. I enjoyed making this so much, that I'm already designing my next one in my head and am eager to begin.